It could have been a mix of his two loves—burgers and border walls—that compelled US president Donald Trump to tweet out his latest typo. On Monday, Trump welcomed the Clemson Tigers, America’s college football champions, to the White House with a candlelit dinner of fast food galore. The internet scoffed at the menu served at this feast, which included items from McDonald’s, Wendy’s, and Burger King that had possibly gone cold. The event was even likened to a scene from 1994 live-action film Richie Rich. The tweet was quickly deleted due to the error, and was reuploaded with the amended spelling. Unfortunately for Trump, things live on the internet forever. The oversight was captured in a screenshot—shown below—by Josh Sternberg, a tech editor at Adweek. Burger King, one of the suppliers for Monday’s banquet, joined in to poke fun at the gaffe. Social media fans responded kindly to the joke. “According to the rules of the internet, the Burger King social media manager is now the new President of the United States,” said Twitter user Daniel Kelly. “But where else can I get a flame-broiled ‘Wherper’?” asked ‘403Verboten’. Trump might need to spell-check his future tweets, for he made a Whopper of a mistake overlooking this one. 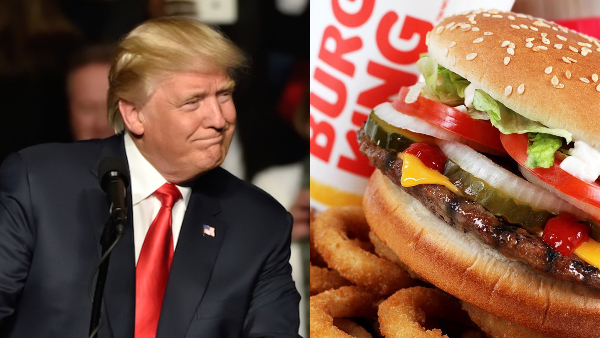 Odd to see beef between Trump and Burger King given how many whoppers Trump tells each day. But where else will I get a flame broiled Wherper?? You need to change your handle to Berder King. It has to happen.